Niels Steensen 1638 — 86 (Danish — born Copenhagen). Dissected a giant shark in 1666. Noted similarity of shark teeth to "glossopetrae" — led him to theory of fossils (i.e., "dug up things") that didn’t grow inside of rocks. Geological laws of stratification and of solid bodies within rocks. 1. Strata are naturally horizontal. 3. Anything that forms inside of something else will take the shape of the void (and not vice-versa). 4. Newer layers will take the shape of existing strata. 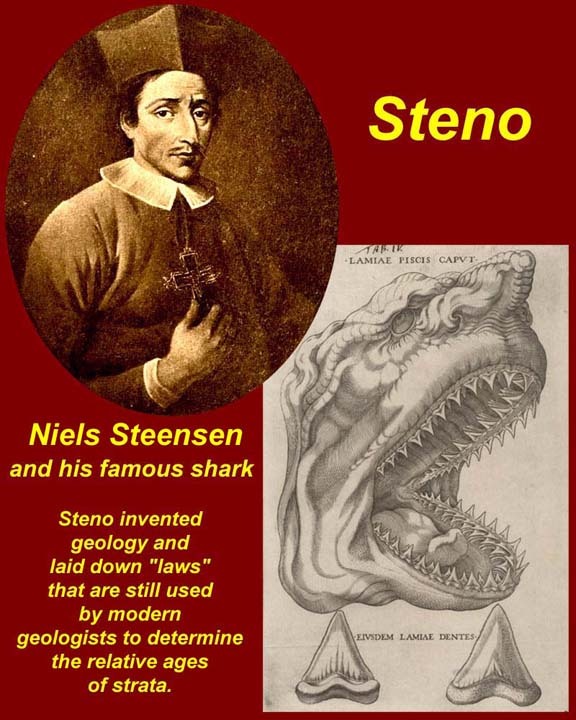 Without Steno, no science in geology. Plates worldwide -- "Pangea" -- "Macro-geology"
Hot stuff rises through lithospere faults. Pooling at the bottom of continental crust — melts bottom of crust — forms crustal magma chamber above. Eventually finds an exit route. Magma chambers can get to be huge -- the one under the bay of Naples has recently been measured at 400 cubic kilometers. (Slide 10) Vesuvius is a stratovolcano / somma volcano on the edge of the caldera Volcanic "products"
Lahars — water mixed with other volcanic products: mud flows, etc. — can be driven by explosive forces, collapse forces, etc. 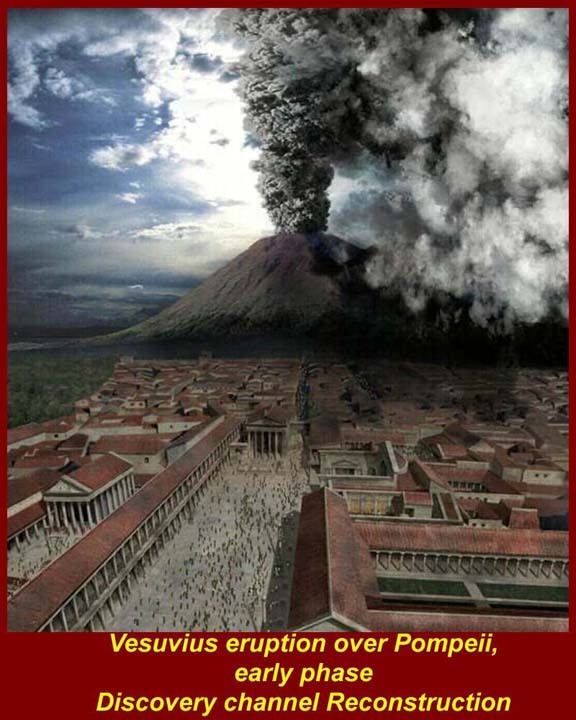 "Lahars hit Herculaneum but not Pompeii." -- false Contrary to what was first thought, lahars weren’t the killers in Herculaneum -- six or more very hot surges. Northern field through which the Tiber flows south before turning west toward the coast. Tiber’s turning point appears to be determied by the northern edge of the slightly harder southern tufas. Often together called the "Campanian Ignimbrite" (but sometimes divided into the "Campanian" and "Yellow" ignimbrites) Depth of ignimbrite from the eruption 1500 meters beep in the center of the caldera Bradyseism has lowered the southern part below water. Sea has eroded the western edge. It’s due to a pre-existing caldera wall blocking flows northward. Terain determined spread of ignimbrite — note above But there are "Campanian ignimbrites on the southern slopes of the Amalfi Peninsula. The Peninsula is topped by the Lattari Mountains a pre-existing limestone ridge that is over 1000 meters high. The pyroclastic flow crossed the bay and overtopped ridge. Eruptions before AD 79: (All dates approximate) 6,000 BC, 3500 BC, 1750 BC, pre-800 BC, pree 600 BC (and many more after, including 1631, a sub-phreatic explosion that killed more than 4000. Connected to the sea by the Grotto (water tunnel) of Cocceius — more than a kilometer long. Built to make Lacus Avernus a naval base, but soon obsolete and Misenum took over. Two additional lakes — semi-craters that are eroded and then coastal debris washed up to cut them in half. (Slide 19) A local phreatic "hot spot" — about 200 degrees C.
Boiling mud, 200 degree hot spring. Carefully controlled pathways — doomed if you step off. Mostly German and Scandanavian campers. (Slide 22) (Slide 23) (Slide 24) A long-continued, extremely slow vertical instability of the crust, as in the volcanic district west of Naples, Italy, where the Flegreian bradyseism has involved up-and-down movements between 6 m below sea level and 6 m above over a period of more than 2.000 years. We’ll see more about this in the unit in which we cover the Baia Bay area. (Slide 25) Explosive -- Gasses and water disloved in the magma suddenly released. Caused by landslides or plug-popping. Produces ash, but mostly "blocks", which are chunks of what forermly was the top of the volcano, and "bombs", which are molten blobs of lava that are shot up into the air. (Slide 27) Often preceeded by one or more phreatic explosions — this was the case with the AD 79 eruption. Produces a tall mushroom cloud — described by Pliny as looking like an Umbrella Pine — which is supported by the continuing ejection of highly gasseous magma through a constricted volcano throat. Fallout in the form of ash, pumice clasts, and lapili. Eventually the gasses that generate the force supporting the the column is expended and/or the throat of the volcano erodes and widens. The column then colapses and a new Peleean phase begins. (Slide 29) St. Pierre on Martinique was destroyed (29,000 deaths) by a Peleean eruption, May 7 and 8, 1902 (For more info, http://www.mount-pelee.com/welcome.htm. Peleean eruptions generate pyroclastic surges and flows. Discovery Channel reconstruction of the Plinian phase of the AD 79 Eruption.